Gretchen told me that when she and husband Steven bought their house near Philadelphia, she liked the quaint vintage 1950s kitchen that came with it. But the longer they lived (and cooked) there, the clearer it became that it needed some updates: “It felt old and dingy, and the fluorescent light didn’t do it any favors.” So they gave it a facelift that didn’t cost a fortune. 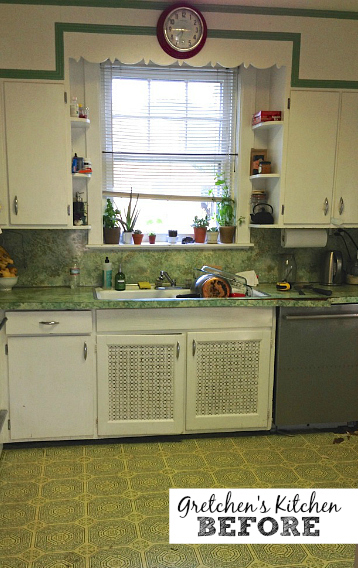 The textured linoleum floors were impossible to keep clean, and the “petri-dish” countertops “literally looked like a sixth-grade science experiment where you grow bread mold.” So they both had to go. They sanded, primed, and then painted the original cabinets and found that they had been painted green and pink in the past. Old newspapers stuffed in the walls dated back to the 1940s. It looks great! 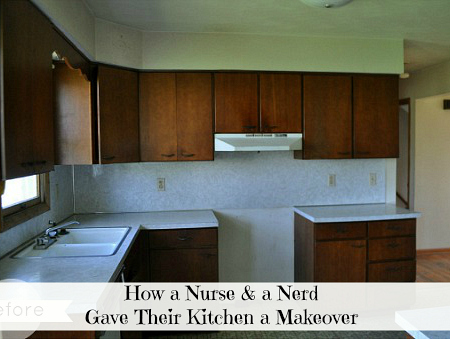 Thanks to Gretchen and Steven for sharing their kitchen makeover with us. For more photos and information, visit their blog House on the Fritz. It looks great! I love the countertops – I wonder how difficult they are to maintain. So far so good on the countertops. I know that butcher block over time can lose finish. We did put many coats of Waterlox on them so I think that will be good for a long time. I don’t mind the look of worn wood anyway- just adds more character. I will say that I do not cut on them. Although they are food safe I prefer not to risk putting cut marks all over them. The one benefit I love about butcher block is that at any time they can easily be sanded down and re-fininished just like wood flooring. That’s a good point — it wouldn’t take much to refinish them again down the road. They look beautiful — thanks, Gretchen! Beautiful! I wish Gretchen and Steven could come to my kitchen and fix it on a budget too. Nice job! Thank you, thank you!! We have so many more projects to come and this makes us stick to budget. I couldn’t be happier with the transformation! That is crazy good I love the backsplash. This is really sweet–and impressive with their budget. Kudos to them! This is fabulous!! Little touches (like taking down the bulkhead, removing the cabinet doors) leads to a HUGE transformation and it’s still looks like it fits in a 1950s house, just a little more modern and CLEAN! Thank you, that’s exactly what we were going for. I hope to keep everything that is attached to the house as appropriate as possible yet modernize and decorate to make it more modern. I was relieved to see the same thing! No granite, no cabinetry rip-out, no contractor-special tile installed on floors, walls, counters–just a tasteful, respectful update. Thank you, Gretchen and Stephen, for maintaining the integrity of your home while still making your kitchen a happy, useful space. It’s beautiful (especially those counters)! Beautiful job but I have a question for you & your readers. Since putting in a new kitchen myself with the quartz counter tops & undermount sink, I find a real problem dealing with the constant water sitting around the faucet since the water doesnt drip into the sink like it used to.These photos of new kitchens arent realistic. Theres always a watery mess around the sink faucet/backsplash area since theres no where for the water from my wet hands to go. HOW DO YOU KEEP THIS DRY & NEAT?? I didnt have this problem before with my aluminum sink & formica top. HELP?? Thanks in advance. Oh, really? That sounds frustrating! Has anyone else had that issue with their sinks? @joy: Microfiber bar mops…. or you can have your fabricator come back and carve in runnels. I love the transformation shown — such a sharp looking renovation on a tight budget. I too hope they keep the stove! We are not immune to sitting water, I am constantly wiping it down. I love having a clean microfiber cloth on hand to wipe everything off once I am finished cleaning up. I do think that the under-mount sink makes for an easier clean up. Everything can get wiped into the sink and nothing is getting stuck in the lip where the countertops meet the sink. We did choose Waterlox because it is waterproof and water will not hurt it over time. In addition to the countertops and new sink, we did add a garbage disposal that I am in LOVE with!! Hi Joy – I am so glad to finally read that someone else has the same problem. I have a soapstone countertop and the constant soapy water dries it out. Then the hard water soaks in and builds up. So then I have to use CLR to get rid of the hard water stains and then keep oiling it (so it looks black) near the taps. Yeah, wish I knew what to expect. At least with the quartz you don’t have it dry out and need re-oiling? I hope?! That kitchen makes me happy! I don’t want her to replace her vintage stove, do you? Love those! Ruh roh, however, on Joy’s undermount sink unhappiness. G.O. wants one in our latest kitchen (he just left to get our IKEA cabinets!) 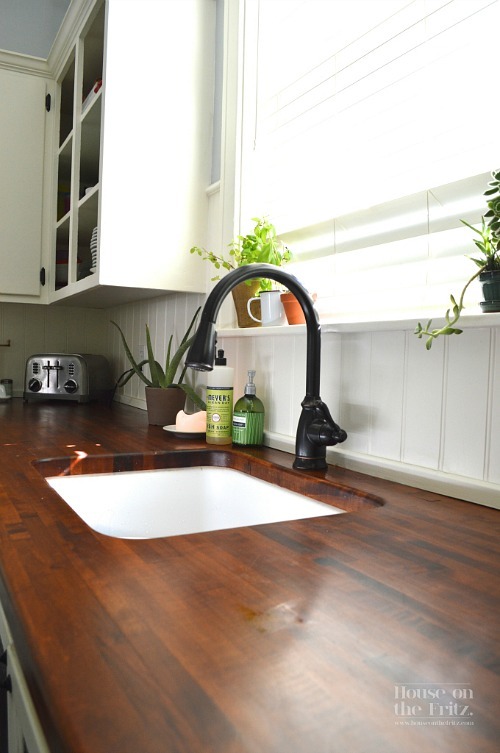 I don’t want to hijack this blog, but I do have a question about the (very affordable) IKEA farmhouse sink. We have one that’s 8 years old, sadly, ours has numerous chips. It looks like the current IKEA farmhouse sink has been tweaked a little; they’re always improving their kitchen products. I wonder if anybody has a newer one + can weigh in on the chip situation. TY. Oh, really, it has that many chips already? Geez. Anyone got a newer one who can let us know how well it’s working so far? Oh, good! I’m glad to hear that. Thanks, Jane! I’m so very, very impressed with how this kitchen looks with the updating – still charming and yet clean and beautiful. 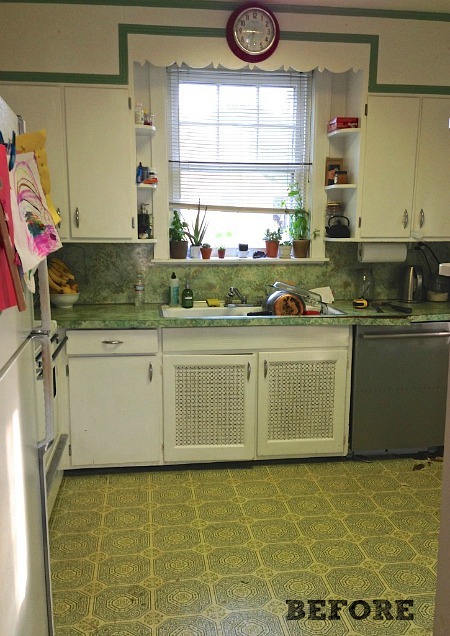 Back in the 70s, I had an almost identical kitchen, except the finish on my cabinets was alligatored varnish over maple, and the prior (elderly) owners had varnished the linoleum as well, to keep it shiny. It was impossible to feel like that kitchen was clean. I don’t see any mention of the backsplash areas – how were they re-done? 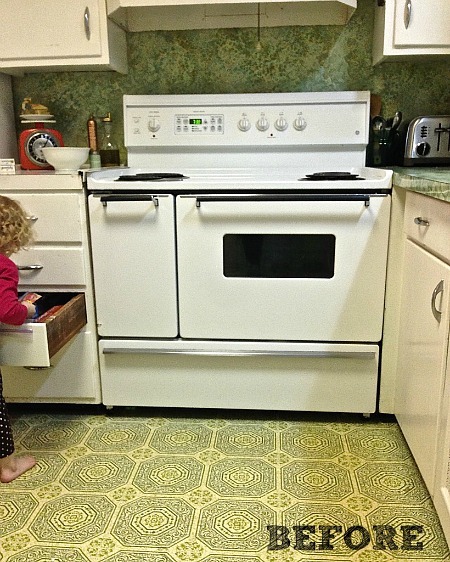 I agree with Kay about the vintage stove – I had a 1940s model that was so reliable and sturdy! It was so well made, you could stand on it to paint the ceiling, without doing a bit of damage, LOL. And Joy, I have the same problem with water collecting on my countertop around the faucet. I have no solutions, other than to be constantly wiping at it. Since this house came with black granite, I’m wiping all the time – everything shows on it. I hope someone has a good answer. Thanks, there was an elderly couple living here too. They liked everything shiny or carpeted. The kitchen walls were been painted semi-gloss. I think the biggest problem with the kitchen for me was my inability to get it TOTALLY clean. The stove isn’t really vintage. I think its from the early ’90s. I would rather go original or update it in the future. We are lucky enough to have gas here and hope to install a gas range in the future. My goal with this house is to keep anything that is original or affixed to the house as authentic as possible. The old backsplash was a continuation of the countertops. We got this wide beadboard (that is really shallow) to replace it. We didn’t want to put authentic thick breadboard in because we didn’t want to take any depth away from the countertops. We also considered tile but had a difficult time finding something that was not too stylized and that would fix with its vintage look. Thank you for showing a real kitchen on a real budget. I get so tired of seeing pictures of kitchens that costs a fortune. This kitchen looks great! Thanks Shannon, there is so much more to come! I do love retro and at first was a little disappointed that the scallop edge and rounded shelves were gone. But the more I look at it, that flooring and countertop were pretty awful, and I do love the new butcherblock. Love that they did it so cheaply! The stove looks kind of vintage, until you spot the digital clock. And I can see how water splashes on the counter around the faucet could be a problem – usually you have wet hands when you’re turning off a faucet. The counter would have to be wiped all the time, I guess. Thanks for the input Laura! I did have a difficult time decided whether or not to remove the old shelves. I did keep the ones on the cabinets when you enter the kitchen. I tend to be a clutter bug and the shelves next to the sink tended to just collect things. With the combination of the open shelving I didn’t want it to look like visual chaos. Gretchen — I love love everything you did with your kitchen. Excellent work and choices with all your finishes! You nailed it! Thanks Jane, this is just the start to the whole house remodel. We are trying desperately to bring this house back to his former glory, and keep as much of its original character in tact. Check out our sight, we have much more to come. Fabulous! You did such a nice job and I really love the counter tops. I am in the group of not a fan of open shelving, but you made it work for you. We do have all of the cabinet doors! I was unsure if I could pull off the open shelving look. It is a constant concern that it just looks like clutter. I do try to stay on top of them but is hard when I have a bunch of sippy cups and crazy kid plates that won’t sit straight. We do have the option down the road to put the cabinet doors back on. We replaced the hardware and kept them in a safe place for if we ever change our minds. I think it looks good and honestly, not like a magazine which makes it appealing. Beautiful and so clever. 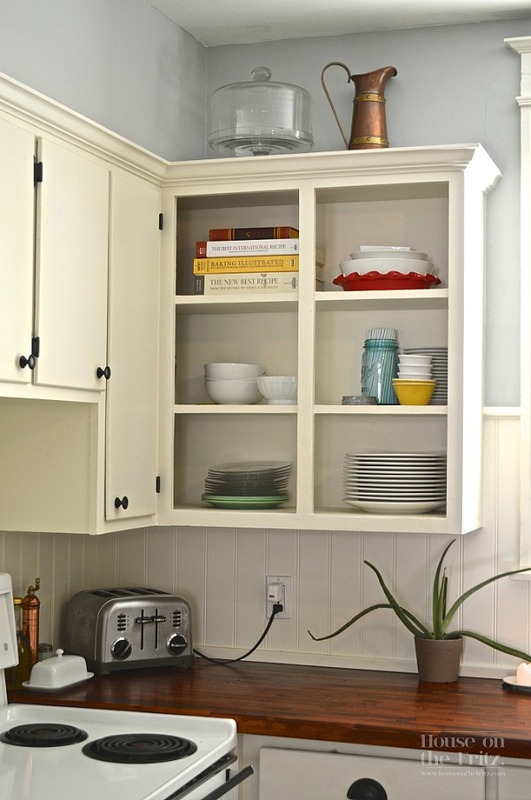 Love how they just took out the bulk head and added trim and created the open shelving. Love the new trim around the window and the new light fixture. Taking out the bulkhead definitely made such a big difference. Now you can see all four corners of the room it feels so much bigger. I also like being able to put some of my favorite things up there. Lighting makes such a difference. The flourecent light was terrible and didn’t to the room(or myself) and favors. The light was really affordable ($100) and it went so well with my beloved kitchen aid mixer that’s “pistachio”. Wonderful wood! Apologies if this has been answered, however, I couldn’t find it– how big is Gretchen’s kitchen? WHERE IS THAT GORGEOUS RUG IN FRONT OF THE SINK FROM? Dierdre, the rug is from http://www.westelm.com. We got it for a steal. It does tend to get quite sorry because it’s in from on the sink but I can throw it in the wash and hang dry. Oops, I was wrong! It was from One Kings Lane, sorry about that! This looks great. 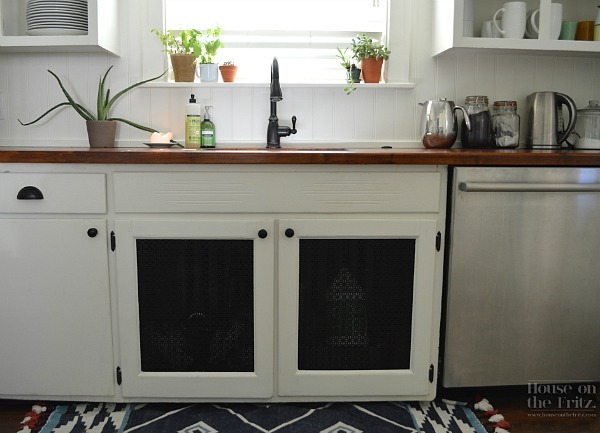 I was able to recycle maple butcher block countertops in my kitchen and I love them. This kitchen combines the best of the old and the new. Nicely done! Good for you. The butcherblock is forgiving and is easy for a DIYer. Thanks for sharing your opinions. I love the feedback. I love the countertops, too! The kitchen looks great; nice job! Thank you Patty, so much more to come! I forgot to ask you..Please tell us more about that cool light fixture! Thanks for the question. We purchased the light fixture at Crate & Barrel. We have one in the area and it was on sale. The light fixture comes in two other colors, yellow and “slate”. I chose this mint colored one because it matched well with my pistachio mixer and my jadeite. I think its leaning on the modern side but it has the shape of an old light fixture. We are so excited to get all this feedback, we have a WHOLE house full of projects to do and can’t wait to share all of them. Love, love, love this! 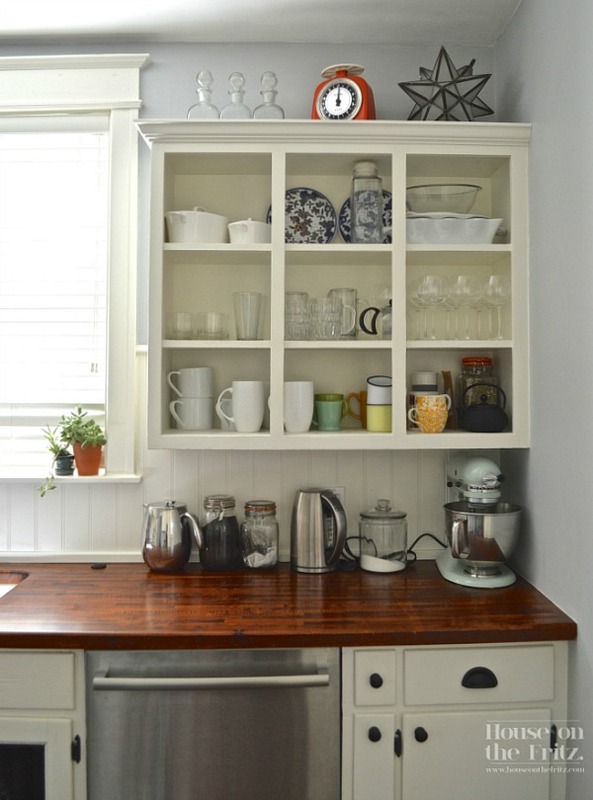 Our kitchen in our 1940s Cape Code desperately needs updating, and I’d love to update it as nicely as you did yours – because our budget is the same. Our ugly kitchen carpet will be first to go, though. Thanks, Julia, for sharing great inspiration! Thanks Kristen, I love all this feedback, its so nice to share this project with people and get some input and advice from other house lovers! Love your kitchen Gretchen!! Love the countertops, backsplash, and light fixture. It turned out so warm, welcoming, and inviting!! Thanks Rebecca! 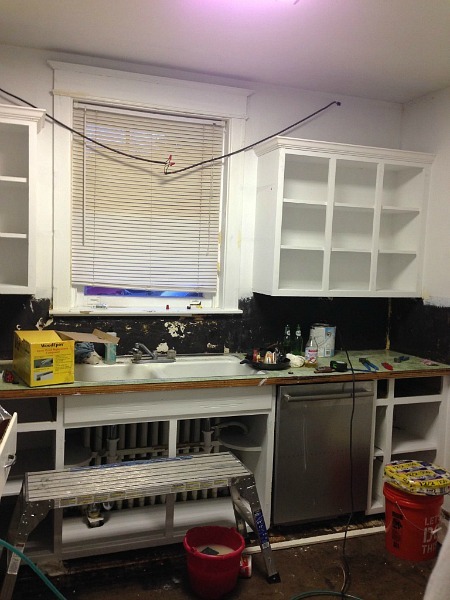 We are so thrilled to be sharing the house renovation project with other home lovers!!! My kitchen redo is also grey but the off white colour I selected is too yellow. What paint colour and brand (if you can say) did you use. Also, I have to wipe facet areas dry after using the sink when I get a build up Iet a small amount of vinegar set there. It works for me but maybe no good for marble it might etch. Your renovation is amazing on the budget your had to work with. We went with Sherwin Williams “Dover White” This is a yellow white but I think it does make it look a bit more authentic and its not too hard on the eyes. “Alabaster” by Sherwin Williams was our second choice because its a bit less yellow. I adore those countertops. 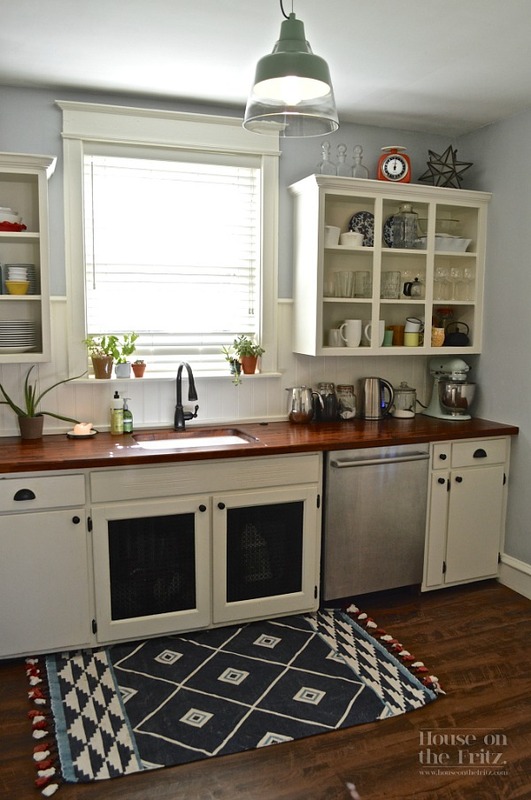 And I really, really want a beadboard backsplash in my next kitchen… Great job!! I just adore your blog. I could get lost for hours in it. They did a great job on this kitchen, and it’s so inspiring to see what they did for that budget. Great profile. This “tasteful, respectful update” – great description, Bungalow Bill – belongs in a shelter magazine. It’s so refreshing to see what can be accomplished with a smaller budget and great vision. It also helps to have a variety of skills to avoid contracting out the electrical, plumbing, and carpentry. I went to lumber liquidators to check out the maple countertops, did you stain those by chance? The maple I’m finding on their site is really light and I love the color of yours! Thanks! Traci, we did stain them. Steven used a water based aniline dye that he purchased from our local woodworking shop. This dye is easy to use and you can darken or lighten the color based on the amount of water you put in. I don’t care how old that stove is, it’s a perfect look for that kitchen. My vote is to keep it. Timo7- Thank for the input- I would be more inclined to keep it if it were easy to cook on, I am not a fan of the electric stoves. But I am hoping to find something that fits well. We already have natural gas heating and we are planning on putting a gas line in the kitchen. Gretchen & Steven- Congratulations on a great job! Sometimes a tight budget results in wonderful, creative results! I love the countertops & beadboard back splash. I love the FEEL of your kitchen – warm & cozy. (white) can help the eye flow. Tuck baskets on top of your cabinets to store stuff you don’t want to see everyday, I think adding some small under the cabinet lights would feature that beautiful countertop in the evenings. Very impressive! Thanks for sharing! Thanks for the suggestion about the baskets. We have considered the undercounted lights, I think that you are right, it would really highlight the countertops. Thanks again for your comment, its great to get such good feedback, we have so much more to come! Great decisions and money well spent. You can always upgrade other items a bit at a time! Bravo! I find it so refreshing and realistic to see a kitchen done on a tight budget. We are bombarded with these massive overdone kitchens – people who don’t cook yet MUST have a $10,000.00 stove and marble counter tops in a kitchen the size of a baseball diamond. Ridiculous. This kitchen is well done, looks great, and probably functions good too. The darker wood counter top works great here and the laminate ‘wood’ floors look nice, too. Really it just goes to show we don’t need half the stuff we think we need – good taste goes a long way in design. Great job! I must admit that I am an avid cook and I think there is something to be said for making what you have work. Not that I would be opposed to a $10,000 stove but its just not realistic for us. I hope to share a lot more of our projects. This kitchen has really pushed me to be as creative as we possibly can and stay on budget. Its possible with good planning and moderation. Awesome renovation! I love everything that was done in this renovation. The stove is vintage enough looking to keep it, but a vintage gas stove would look really good here. Gretchen your blog is so fun, can’t wait to see the rest of the renovations being done. Thanks Carol, so much more to come.